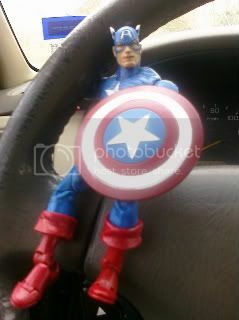 Once we had established that Captain America did NOT want to drive, all was well. He never would tell me who put him up to the joke, because he IS Captain America. He never reveals those sorts of things. I was a bit concerned as to whether Mr. T-Rex had eaten recently, but he assured me that he had dined the previous evening. I told Mr. T that he was welcome to eat all the june bugs or squirrels he wanted, but cats were strictly off limits. I am not sure how I feel about finding these particular critters in my car. I have visions of my vehicle being driven off by the entire Justice League, for instance. 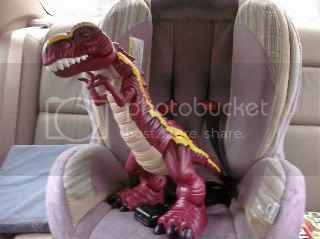 And truly, this is all I want to see in the backseat after a long day! That sweet face is a blessing to all who look upon him, as far as I'm concerned. 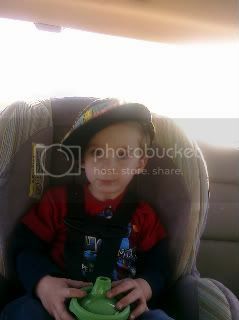 He is worth all the extra passengers I find in my car. Totally worth a whole army of anything!! !